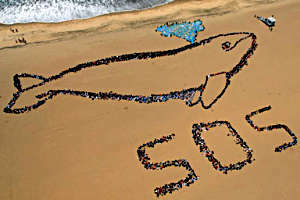 Volunteers have a whale of a time working to save our seas. Join the fun this weekend! OceanHealth.Org teams up with the San Francisco Chapter of Surfrider for our annual World Ocean Day beach cleanup in San Francisco at Ocean Beach. There will be gloves and bags. Just bring yourself and dress for variable weather. The event is co-sponsored by the California Academy of Sciences & the Aquarium of the Bay. I have quite the personal connection to SF’s Ocean Beach. For the past 2.5 years, I have led the Ocean Beach Foundation, working to preserve the beach with the fire pit installations as well as organizing weekly cleanups. It’s quite amazing what you can find out on the beach during cleanups…I’ve found everything from a huge Barbie dollhouse to an old school Radio Flyer (the toy of my youth!). I hope you’ll take part in the Ocean Beach cleanup. OceanHealth.org is celebrating World Ocean’s Day by screening a few short ocean films. We hope that you’ll join us in this great location to share our love of the oceans and to view a variety of films showing perspectives on the ocean. Purchase advance tickets at http://www.victoriatheatre.org or purchase tickets at the box office on the day of the film. Cost $10. The Academy and its partners in the San Francisco Seafood Watch Alliance are pulling out all the stops to encourage visitors to make sustainable seafood choices. Local celebrity chefs will whip up tasty treats during sustainable seafood cooking demonstrations: Eric Magnani from Global Gourmet Catering, Kin Lui and Casson Trenor from Tataki Sushi & Sake Bar, Craig Stoll from Delfina, and Loretta Keller from COCO5OO and The Moss Room. Also, we’ll host a screening of “The End of the Line,” a new film about overfishing that received rave reviews at Sundance. Nightlife often sells out, it is suggested to buy your tickets ahead of time. There is also a free party to celebrate World Oceans Day tonight, June 8, at Triple Crown, 1760 Market Street, San Francisco, from 5:30-1o:00 pm. Kishore Hari is the founder Down to a Science, a science cafe based in San Francisco. He is most passionate about making science discussion fun and accessible for adults, the kind of discussion that leads to positive change in the world. Professionally, he is a water treatment consultant in San Francisco. Originally from Buffalo, NY, Kishore came to the Bay Area to get a chemistry degree from UC Berkeley. He now specializes in residential water treatment, working with companies such as PUR, Brita, and Camelbak.